First of all, below are examples of famous and fabulous people who state the obvious. Would you believe that some of the above quotes could be termed as politically incorrect. Coco Chanel was a French fashion designer and a business woman. She was the founder and namesake of the Chanel brand. Chanel was credited in the post-World War I era with liberating women from the constraints of the “corseted silhouette” and popularizing a sporty, casual chic as the feminine standard of style. She is the only fashion designer listed on TIME magazine’s list of the 100 most influential people of the 20th century. 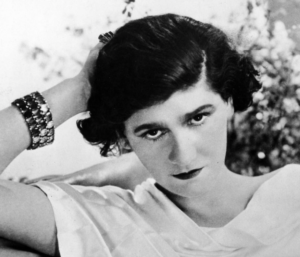 Coco Chanel was a liberated woman who understood the power of fashion. When dressing it is important for the garment to follow the body of the woman, not the shape of the dress. How did your homework go? Are you confident with your choice of body type? Lets start talking about them. At a mature age our bodies tend to be “more” than what we started with. Embrace these changes – they have come about by all manner of events – babies, operations, menopause to name a few. Once we know our body shape and understand the clothes that will accentuate our good features – the rest is easy. How did you go with your “going to the mall” homework to watch and learn? Balance is a key word to dressing to suit your body. If you have broad shoulders and small hips (the inverted triangle) it is a must to add body to the lower section of your body. Small shoulder and large hips (like a pear shape) you will need to add volume to your top area. The hourglass figure, with shoulders and hips in line, a defined bust and waist and a curvy bottom is balanced so following your curves when dressing is important. Fit is above all the most important thing in dressing – don’t follow trends – follow your body shape, your lifestyle. Furthermore, finding the right colour for your skin tone and hair colour is very important. And remember, the colours that suit us when we are 20 are not necessarily the colours that suit us when we are 40, 50, 60 or 70 and up. There is no limit to our ever changing bodies. Finally, and for all of those reasons noted above – pop on over via the link to my website www.creativeartwear.com.au and start looking at shapes and colours, ask yourself why you like a certain colour or shape. Another very important reminder, and most noteworthy – shop alone – have the confidence to do this – your friend, daughter, mother etc have different tastes and like different things to you – they will subconsciously favour something they would like to wear – not what you would like to wear. Bye for now. Hope your thoughts are racing.